Since I started knitting, I always heard two very different opinions on knitting socks. 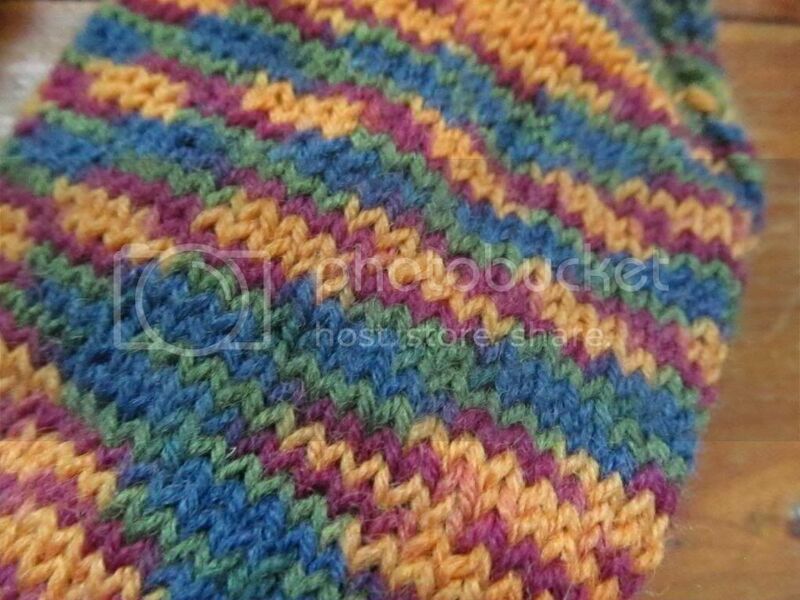 Opinion #2: I love knitting socks! They're so much fun. I make them all the time and haven't worn store-bought socks in years. So this year I decided to get over my fear of sock knitting. I had started on a pair using a free pattern from Hobby Lobby, but hadn't gotten very far. Then I found Silver's Sock Class through Ravelry. 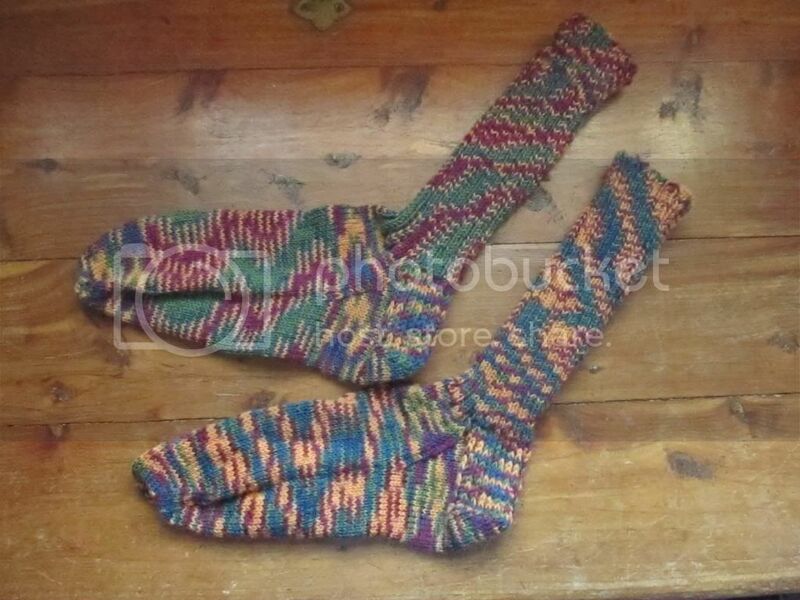 And here they are: my very first knitted socks. And to think that you made a pair of socks that are wearable and fit...that's a pretty lovely feeling. I imagine it's what knitting a sweater feels like, but on a smaller scale. I love looking at all of those tiny little stitches. 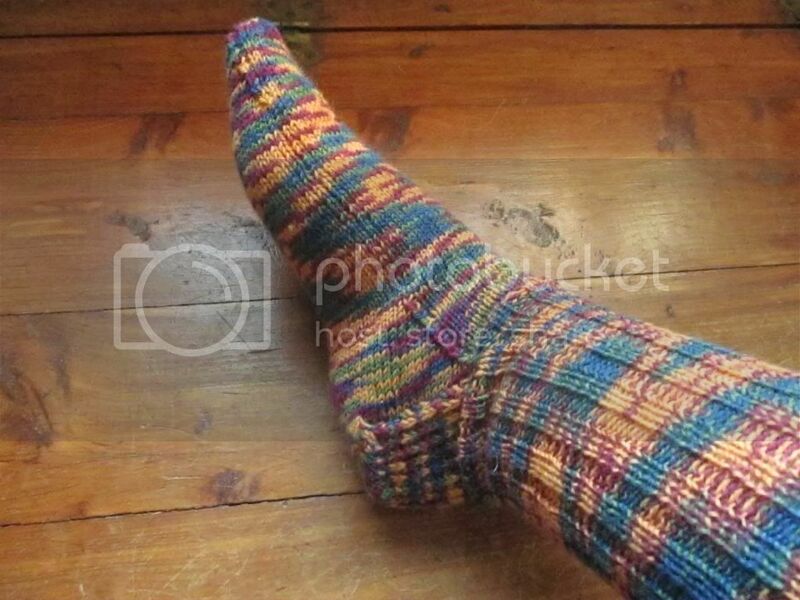 I love how the toes on knitted socks look weird and squareish until you put them on, and then they're perfect. I also learned that it's really weird and awkward to take a picture of a newly knitted sock on your own foot. My dad had asked me a while back to knit him a hat, but I don't think he really thought I would do it. :) I really wanted to make a green one, but couldn't find the right yarn (he wanted wool), so I had to use this camo yarn. Which I thought would knit into splotchy camouflage. Instead it knitted into stripes, which I'm not too crazy about. It was a pretty easy hat...I finished it in two or three evenings. It was my second hat, and my first one with ear flaps. If you're interested in what patterns I used, you can find that info on my Ravelry projects page. Great job! I've always wanted to learn to knit socks, but I can barely knit a scarf and am thinking it will never happen! In which I discuss Doctor Who.